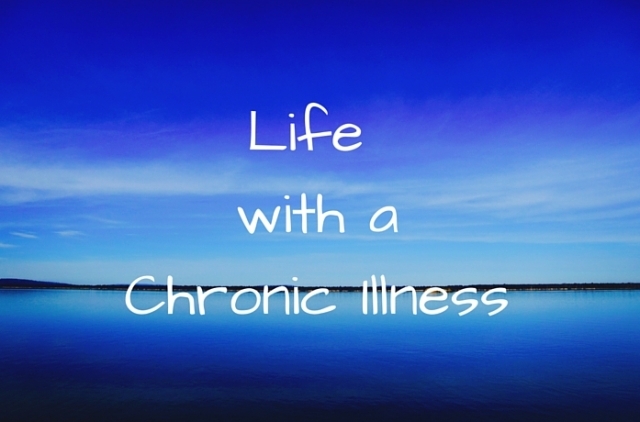 In Chronic illness/disability, Etc. Etc. Etc. 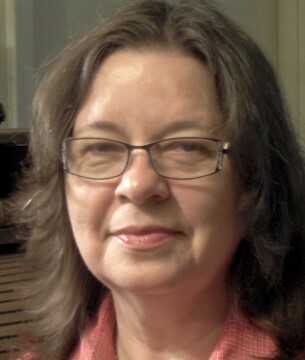 Katharine Trauger is a retired educator and a women’s counselor. She has spent 25 years managing a home and school for children who would otherwise would have been homeless, and has worked 15 years as a contributor and/or columnist for several small professional magazines, with over 60 published articles. She blogs about the rising popularity of “being at home” from a sun room on a wooded hilltop in the Deep South at: Home’s Cool! and The Conquering Mom and tweets at Katharine Trauger (@KathaTrau). She is currently working on a self-help book entitled: Yes, It Hurts, But . . .
A note from Jamie: Welcome my friend Katharine who talks about living with sleep apnea and using a CPAP machine. I was diagnosed with this same condition 15 years ago and attest to how important the CPAP machine is! When we blow into a baby’s face, he will gasp and panic as if suffocating. That’s how the Continuous Positive Airway Pressure (CPAP pronounced see-pap) machine feels, at first. The first time I felt such panic as an adult, my eye doctor had asked me if I suffered from sleep apnea and had requested I schedule a sleep test. He had discovered evidence for curing eye problems by remedying sleep apnea. Apnea means stoppage of breathing, which causes oxygen deprivation. Some simply forget to breathe; others have physical causes in the airway. The first, ever, CPAP patient had originally been scheduled for a tracheotomy so he could safely sleep. For him, CPAP therapy must have seemed miraculous. I do suffer sleep apneas, but I did not know it; I was asleep, after all. I have lately come to realize I also experience an occasional daytime apnea when I am calm, such as while reading. I was eager to test, however, parts of the apnea test made me panic. The test occurred in a hospital, in a room like a hotel. There was a video camera trained onto the bed. Privacy areas were also provided. Yay. The sleep technician spent an hour explaining everything, then glued about 20 wires to me and helped me adjust the mask. And told me not to panic. I then tried relaxing and sleeping, with my every move televised into the technician’s office. I brag that I can sleep anywhere. This test proved it. That is, I slept. However, I tested at an alarming number of apneas and now receive sleep therapy with a CPAP machine. The machine is rectangular, about 6”x10”x4” high. Inside this small space an incredibly quiet fan pumps air through a humidifier/warmer, into a featherweight hose that reaches to the bed. At the end, the hose attaches to the face mask, nose mask, or nostril mask (patient’s choice). 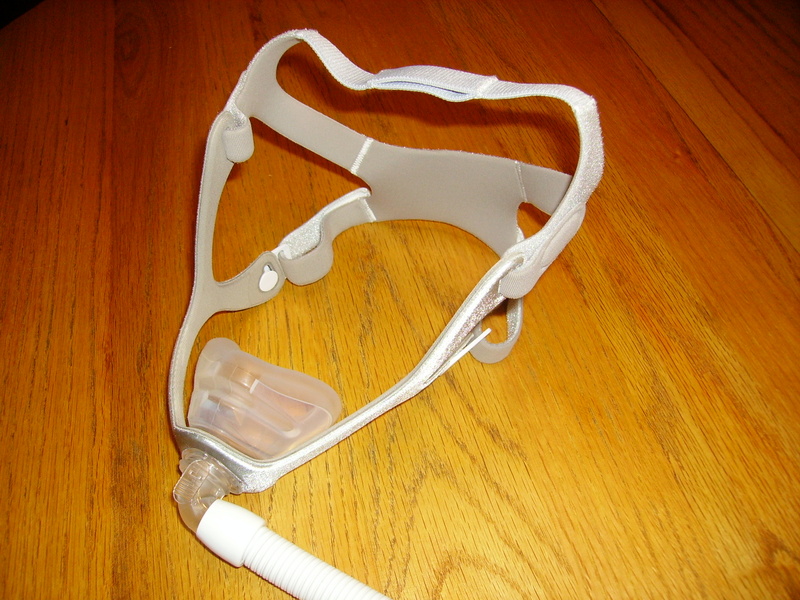 The mask is held in place by adjustable straps encircling the head. It’s not pretty. But the lights are out. Care of the machine includes rinsing the humidifier reservoir and the hose and washing the mask and the air filters. 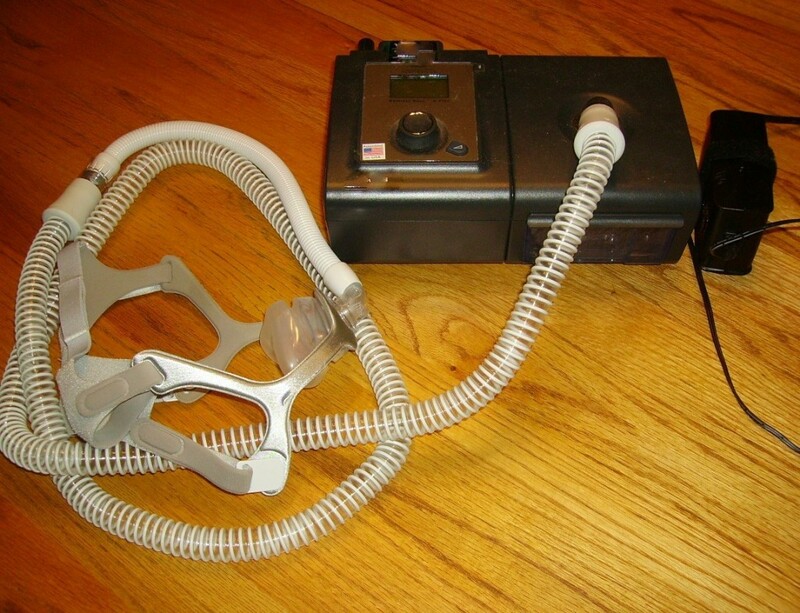 CPAP machines have been improving health for decades and in the process have gained improvements, themselves, such as non-bruising, all-silicone masks. These days, manufacturers cooperate to make parts interchangeable between companies. Today’s machines use computers to monitor sleep on an electronic card for the doctor. It can begin pressurizing your breathing at a low rate and gradually increase until it reaches your prescription setting. It can gently warm the air on cool nights. It can sense your apneas and blow more forcefully. I work closely with a respiratory therapist, who fitted my mask and helps me immensely. The mask I’ve selected fits entirely over the nose and adapts perfectly to the contours of the cheek and upper lip. I wear it every time I sleep. It is comfortable, unless I adjust the straps too tightly. The way to adapt to the CPAP is to keep trying. The first nights are not wonderful. For a week, I was getting up, frustrated, checking a mirror and a diagram, and making mask adjustments. Many quit and forfeit the benefits because of the first week. There are so many rewards for mastering a CPAP. The first night I actually received the sleep it is meant to deliver was a gift. I used to resent sleep as an intrusion; now I literally can’t wait to sleep again. Oxygen! What a difference it makes! The patient user will learn to appreciate the CPAP. It allows falling asleep faster, staying asleep longer, and waking more rested. It gives more energy, mental clarity, and helps cure several illnesses, such as macular edema, diabetes, and hypertension. I’ve received a remarkable report from my eye doctor, I have unexplainable strength in my legs, I don’t accidentally fall asleep during the day, and I lost five pounds during Thanksgiving. We little dream how much we suffer while asleep, how much the body would respond to better sleep and to more oxygen. That is, until we employ the CPAP. What a great article, Katharine! My heart patient husband got to the point of falling asleep at traffic lights before I forced the doctor to get him to a sleep specialist…that was years ago. Now I sleep. He sleeps and life is soooo much better. Shout this to the world, dear friend. I know of others who, like you said, quit. Thanks for sharing! I’d like to know how you forced a doctor to do anything, though! Ha! But for too many, it’s true. Oxygen deprivation is no joke. I’m going to share this with a my daughter-in-law who has been told she needs a CPAP. Hope it will encourage her to persevere at the beginning. I’m glad you did and that you’re seeing positive results. Oh, me too, Dorothy!It’s making such a difference! I am constantly surprised at how much more vigor I have. Thank you for sharing your story. It’s always good for people to be able to see what it’s really like to live with a condition like CPAP. You usually only see information out there directed at men too – refreshing to hear from a woman going through this. Jordan, I appreciate this comment! The CPAP, however, is not, technically, a medical condition, but rather it is the prescription for it, the medicine, if you will. Like braces for crooked teeth. I’m sorry if I gave a wrong impression and thank you for giving me an opportunity to make it more clear! But live with it, yes, that is right. Especially so, if you consider that without it, many would die. So few realize that apnea kills. When it doesn’t kill, it only merely causes brain damage from lack of oxygen. Every. Night. They say more men are susceptible to apnea, but I suspect that could be because more men are prone to admitting–or even bragging–that they snore, and snoring is often touted as THE sign you need help with apnea. And we all know, snoring is sort of loud and difficult to imagine as ladylike. The word is one letter away from the word for the sound a pig makes, and rightly so. And, as I said in the article above, the equipment is not pretty, although I neglected to mention it is far nicer-looking than it once was, another improvement from the ages of use. Actually, people with apnea do not always snore. Take me for instance: Everyone says I do, but actually they are quite wrong!